(Nanowerk News) "Coherent control" is an important concept in all scientific fields that deal with the manipulation of light waves, electronic charges or molecular motions. Coherent control is the use of coherent radiation, such as that generated by a laser, to change the behavior of atomic, molecular, or electronic systems. For instance, a correctly shaped laser pulse can be used to induce a molecule to vibrate and react in a certain, selected, way. Coherent control involves the possible control of any coherent light-matter interaction. Coherent control approaches have been applied in recent years to a broad variety of problems, ranging from atomic physics and gas-phase molecular dynamics through solid-state physics and semiconductor device technology to solution chemistry and biology. While use of the intensity and coherence properties of lasers for control is widespread, recent research on feedback control of molecular dynamics has utilized also their polarization property. Extending coherent control methods to nanoplasmonics opens a new class of problems with associated new challenges for coherent control. It also creates the possibility of applying coherent control approaches in future nanoplasmonic devices, such as switches and logic elements. One researcher working in this field, Professor Tamar Seideman at Northwestern University, told Nanowerk: "In recent and ongoing work we suggest a new and exciting application of phase and polarization control, which is of fundamental interest and which may also carry practical benefit, namely guidance of light in the nanoscale via metal nanoparticle arrays." Professor Seideman together with a member of her group, Maxim Sukharev, extended the concepts of phase, polarization, and feedback control of matter to develop a general approach for guiding light in the nanoscale via nanoparticle arrays. 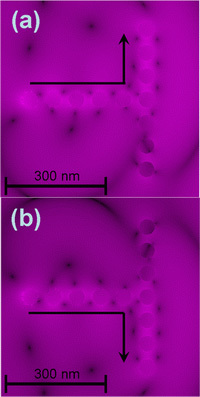 Their paper, titled "Phase and polarization control as a route to plasmonic nano-devices" was published on Feb. 25, 2006 in the online edition of Nano Letters. Based on the ability of metal nanoparticles to enhance light in a shape- and size-sensitive fashion, the physics underlying light propagation via nanoparticle arrays was proposed several years ago and is well understood. In an array of closely spaced nanoparticles, the surface plasmon resonance enhances the interaction between adjacent particles and may thus give rise to collective response to external light, where near-field coupling between closely spaced particles sets up coupled plasmon modes. Despite the significant progress that recently has been made on the problem of light interaction with metal nanoparticle arrays, several challenges remain. One questions is how to choose the size, shape and relative arrangement of the nanoparticles so as to guide the EM energy to a specific location, or, more generally, to make nanophotonic devices with desired optical properties and hence desired functions. Another question is how to design the nanoparticle array so as to minimize losses. First, they introduce polarization control as a general method of producing superpositions of transverse and longitudinal plasmonic modes whose (controllable) phase relation allows guiding of light through multiple branching intersections. Next, they illustrate that genetic algorithms can be applied as a systematic design tool, to optimize not only the field parameters but also the material size, shape, and arrangement so as to make devices with desired functionality. Finally, they suggest the possibility of using coherent control techniques to better understand the optical properties of interacting nanoparticles. – Designing laser-assisted 3D atom probe experiments, a method that provides atomic-scale imaging of materials.